Mobile payment service Android Pay is rolling out today. Android handsets that come with an NFC chip will be able to use the feature when checking out at retail stores and restaurants that have an NFC-based POS system. Those who had downloaded the Google Wallet app can update it to Android Pay. New users can download and install Android Pay directly from the Google Play Store. 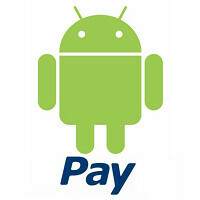 New Android handsets from Verizon, AT&T and T-Mobile running Android 4.4 or higher will have Android Pay pre-installed. Unlike Apple, which gets .15% of the value of a credit card transaction and .5% of the value of a debit card transaction with Apple Pay, Google is not taking a dime with Android Pay. That's because Master Card and Visa are allowing Google free access to their standardized tokenization security features. With tokenization, credit card account numbers are exchanged for a unique series of numbers that will validate a specific transaction, but keep credit card account numbers secret. Google says that Android Pay will be accepted at Best Buy, McDonald’s, Macy’s, Walgreens, Subway, Whole Foods, Toys R Us and more. Additional banks and stores will hook up with Android Pay in the near future. A PIN, password or pattern will authorize an Android Pay transaction. Those with a handset powered by Android 6.0 Marshmallow, will be able to authorize transactions using the native fingerprint support that comes with the newest Android build. Samsung Pay, the manufacturer's entry in the mobile payment business, will debut in the U.S. on September 28th. Unlike Apple Pay and Android Pay, Samsung Pay will work even if a retailer does not have an NFC based POS system. In that case, it uses the same magnetic based swiping technology that retailers use to ring up credit cards. Samsung Pay is going to likely be the most used providing they get enough devices with it. 90% of retailers already accept magstrip and always will do to old people. NFC will disqualify the vast majority of iOS users. With Google, since most retailers dont have NFC based readers, that leave not enough people to use it. Basically in its first year, Samsung Pay could have more usage than Android/Apple Pay combined. Why didnt Google and Samsung team up on Loop Pay in the first place. We don't need competing payment system. We need s single industry standard. Samsung Pay can only be used by a couple ten million phones since the S6 only sold that much. And even then, how many of those with Samsung Pay in their phones will bother to use it? Techie I agree with you on this one! how can I do it ??!?! where is app ? am in uk where is fkin wallet ???????!?! yeah they freaking saying this over 5 year frkin noo not yeeet noo still noot.. fuk wheen ??? Uhm... I... Don't know what you just said in the first part, but UK release date hasn't been clarified or addressed at all yet by the Googs, so give it till Saturday to find out what the plans are I'd say. ''android wont run unless u update gPlay services... and there is no update..
fkin crap is google ..! seriously ! Holy CRAP!!!! Chase Bank, the LARGEST bank in America is not supported? WTF Google? WTF! If you already have a Chase card issued in Google Wallet, it's grandfathered into Android Pay(at least for now) Just today at Mcdonald's I used Android Pay with my Chase card on the terminal and it worked no problem. Well well looks like android took one from the playbook of Apple huh? Nope, Google wallet was doing this but the app was a mess. Android pay is a very simple implementation of tap and pay. You had to add money to the wallet for it to work with NFC. Just adding your CC/debit didn't work for NFC, only for online payments. It's taken them too long to start rolling this out, what's the point in having features first if it takes a few years before we can use it for it's intended purpose. Just a waste of time.